Ever read those Best Kayak For Fishing Reviews? What Kayaks can meet those needs? How those Kayaks compare to each other. Only then can you be in a position to choose wisely. Different Kayaks are tailor made for different niches. Niches determine how applicable a kayak is. People in a similar environment. Apply this simple trick. You will land the best bargain of the best fishing kayak for the money. This monstrosity comes with an immense storage space. Fit for the live storage enthusiast. It has a capacity of 425 lb. Very well suited for the plus-sized fisherman. It also has a length of 13 feet and 2 inches. Speed will not be an issue. The length also makes it very easy to paddle. You will love The Predator. The Old Town Predator 13 boasts of a 33.5-inch width. This translates to increased stability. Standing is also easy and comfortable on this kayak. It is definitely one of the best kayaks for stand up fishing. You will also love the comfortable seat. Longer fishing trips will be more bearable. The downside of most Sit-On-Kayaks (SOK) is a wet ride. The Predator 13 is way ahead of you on this one. An integrated drainage system ensures a dry ride. 8 scupper holes in total drain any water that invades the rig. The only downside to this rig is its weight. Despite the stability, it is almost impossible to stand if tipped over. Amazing storage space: Perfect for live fish storage facilities. Excellent standability: Perfect for stand up fishing. Comfortable seat: Makes lengthy trips bearable. Dry-ride enabled: For when the water is extra chilly. Very stable: It is, as they say, better safe than sorry. This thing is heavy. It easily clocks 100 lb with minimal gear. Make sure your car can manage the weight. If your cartop's weight limit is below 100 lb, work up a plan. The plus-sized fisherman who loves his speed. The fisherman who sails heavy. This beauty will do it with lots space left over. It will also be perfect for fishers into standup fishing. Not too fast, though. You need to get used to a kayak before standing on it. The lifetime sport fisher is 10 foot long and 36 inches wide. You will not be getting any speed tickets. Being wide makes it very stable. It is surprisingly easy to stand on. The intelligent engineering of the hull makes tracking very easy. Another big plus is accessories. You can begin fishing, immediately, after delivery. Another thing I really like is the price. This is easily the best cheap kayak for fishing. You will find it to be quite a bargain. The Price: It is good value for money. Notably cheaper than similar kayak﻿s. Weight: At 62 lb, it is very manageable. Transport is easy. You will also find it easy to turn-over if it ever got tipped over. 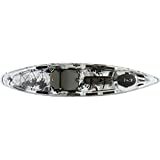 Accessories: The accessories on this kayak make it good value for the buck. You also have the option of adding on trolling motors. Dry Ride: This is made possible by raised seats. The well-placed plugs also help the drainage. Stability: The 36-inch width allows for some good stability. Multiple foot-holds: This makes it comfortable for users of varying heights. It also helps when you need a sturdier foothold. Especially when reeling in big fish. Comfort: The seats could use some cushioning. Weight: The light weight would prove disadvantageous under windy conditions. The kayak would find it hard to remain stable. It is perfect for family and friends. Increased stability makes it good for stand up fishing. This kayak is for you if you are on a budget. 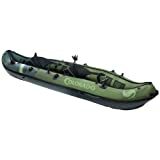 It is one of the best affordable kayak for fishing. Standing on it is also very easy. If you are new to kayak fishing, try it. It is the best beginner kayak for fishing. It is not surprising that it sells well. Any kayak that supports wife-accommodation will do well on the market. After all, 78% of kayak fishermen are married. The convenience of inflatable kayaks is, usually, at the expense of durability. Not so with the Sevylor Coleman Colorado. Built with the solid 18 PVC gauge, it is tough. The kayak’s bottom is made of 1000D tarpaulin. The whole frame is then complemented with 840 D nylon. If you are new to the terminology, this simply means IT IS AS TOUGH AS TOUGH GETS! Security is a concern for inflatable kayak buyers. This kayak addresses security concerns perfectly. It comes with multiple air chambers. If the body gets punctured, you will stay afloat. This feature is just for enhanced security. I have worked with the rig. Very hard to puncture. This kayak fits two people comfortably. For the newbie, you can have a pro on board. It is also very stable. At 10 foot 9 inches long; 3 foot 3 inch wide; this is to be expected. Easy Inflate and Deflate: This is thanks to its double threaded Boston valve. Stability: It is stable in any water. Secure: Chambered inflation increases protection from punctures. Adjustable Seats: You can adjust the seats to your convenience. This is important; only you can determine what is comfortable for you. It also helps if you need to change sitting positions after a long day. Pressure Gauge: Helps you while inflating the rig. Storage Pockets: The rig is fitted with a good number of storage pockets. It provides enough storage room for carrying fishing accompaniments. It can improve on the design. It is, currently, hard to paddle without hitting the rig. This takes a lot out of your paddle’s stroke. You will find yourself expend a lot of energy with this rig. I recommend it for river fishing. The stability it offers will prove sufficient. I rank it among the best kayak for fishing on a river. Especially, if you are, on a budget. Be sure only to use it if the best fishing spots are not far from the shore. It is tedious to paddle. It is, therefore, not well suited for deep sea fishing. You will want to use it for the river. This Kayak is really one of the best fishing kayak for rivers. Aesthetics, however, does not count for much when it comes to kayaks. Let us get into the nitty-gritty of the rig. It has a flat cockpit. This kayak is good for stand up fishing. Definitely one of the best kayak for stand up fishing. The 12-foot 1-inch length offers good speed. A 33-inch width makes it very stable. This is true even for rough waters. One more thing to note, the mirage outback is a pedal kayak. Pedals are always better than paddles for long distance fishing spots. Attached is also a high vantage seat that makes the pedaling easier. Speed: It is very fast for its weight. Comfort: The high vantage seat is very comfortable. Stable: It is very stable in all kinds of waters. Easy Propulsion: This rig is easy to propel. The mirage drive on this rig has the BlueFin update. It was easy enough to propel without the upgrade. BlueFin just improved on a, near perfect, propulsion system. Price: This rig is a high-end buy. It is way more costly than its closest competitors. Weight: Weighing in at over 100 lb, it is not very portable. You will also have a hard time if it ever gets tipped over. For the fisherman who wants to go where no one else has. It is perfect for long distance fishing. Being pedal powered, you do not propel it with that much energy. What I love about it, is its convenience. Because the arms are free, you can fish as you move. So, if you want a kayak with an option to paddles, you've got it. It may be high-end, but, its worth every penny. At 12 feet, the journey 12 has amazing tracking capabilities. Speed will, also, not be an issue on this kayak. It is, also, very light. Barely 50 lb. You will enjoy its dry compartment. Very safe for holding your phone, wallet or any other electronics on board. Adjustable foot braces help the customer determine just what works best for him/ her. Protective thigh pads are also a welcome addition. Especially seeing they come at no extra costs. It also provides a large sitting area. This is complemented by an open cockpit for ease of entry. The kayak is awesome for fishing in far to reach fishing spots. This is due to its light weight. You will not have to use a lot of energy to propel it for long hours. What I especially like about this kayak is its price. We have in our hands a contender for the best budget kayak for fishing of all time. Storage Space: It is equipped with very decent storage space. Good Tracking: It has amazing tracking capabilities. Comfortable Seat: You will find this helpful when you venture into the deep. The Price: I consider it one of the best cheap kayak for fishing. Weight: This is one of the lightest non-inflate kayaks ever made. It is easy to transport. Poor Standability: You SHOULD NEVER stand on this kayak. It is not made for stand up fishing. YOU WILL FALL OFF!! Poor Stability: The light weight comes at the expense of stability. It is very poor in rough waters. The fisherman into simplicity. It is a basic rig. It will definitely impress a good number of them. Fishermen love their simplicity. Only 2% do motor propulsion. 81% prefer old school paddling. Pedals are preferred by only 17%. So you see? You are not alone. Simpler is usually deemed better by most fishermen. For the price, it is definitely, a good buy. The best option for the fisherman on a budget. You will get a lot from it for its price range. Plus, you can always modify as you go along. A 12.5-foot length makes this kayak easy to track. It also provides some fantastic speeds with little energy. It comes with two deluxe seats. They make the whole fishing experience more comfortable. It is also just 68 lb. A very manageable weight. Getting it to the river will not be a hassle. Do not be fooled by its lightweight; it can hold up to 450 lb. You will also be treated to multiple footrests. The designers obviously had long distance fishermen on their mind. Useful UH-TK181 also comes with good bungee rests for your paddles. Like I said, it is designed for long hours on the water. Comfort: It is made for comfort. You should consider it for those long fishing trips. Stability: The width on this kayak makes for excellent balance. Speed: Speed is good. Not very fast, though. If what you want is a really fast kayak, this is not the one. What it offers is a slightly above average speed. That is as far as these kayaks go. Storage Space: The storage space is pretty decent. Weight: 68 lb is a very manageable weight. Price: It is on the low end. It is quite a bargain for a kayak. It could use a seat cushion and adjustable foot braces. You may also have to fit in back-rests. It does not come with any. For the kayak enthusiast on a budget, consider this one. Especially for those far to reach fishing spots. It is an excellent addition to the family. It is fancy enough to impress your wife. Simple enough for your kids to control. Well-Made for any fisherman. It is an all in one kind of kayak. Useful UH-TK181 a good kayak for practically any environment. Should you ever be short of cash and ideas, go with this one. It is very hard to fault this beauty. A very safe bet for the cautious purchaser. This kayak is only 56 lb. Very light for a kayak. It is therefore very portable. Regardless of the weight, it is amazingly steady on the water. The maximum capacity is about 450 lb. Quite a feat for such a light kayak. It comes with a molded-in seat and an extra comfort seat. You have variety when it comes to sitting. This kayak is especially nice when fishing alone for extended periods. The 13 foot 4-inch length is good for speed. It also makes tracking very easy. The width is only 28 inches. Not very wide for a kayak. This drawback, however, does not seem to eat too much into its stability. Scupper compatible with a transducer. Design: It is well designed. Stability: Amazingly stable for its 28-inch width. Speed: It offers very good speed on the water. Storage Space: This rig comes with more than sufficient storage. It will satisfy even the most ardent fishing pro’s needs. Weight: This was a masterpiece. A near-perfect balance of weight and stability. The price is a little too high. Apart from the price, it is hard to fault this rig. Fishers are always serious about fishing. The price is enough to scare away most. The courageous ones will reap big, I PROMISE. For a rig with minimal maintenance cost, I advise you try this one. It is a very worthy buy in the long run. The prowler’s specialized design makes it very durable. I advise it for the corrosive salty waters. This kayak is one of the best kayak for fishing salt water. If you are looking for a salt-water fishing kayak, look no further. Sun Dolphin Aruba 10 is the cheapest kayak on this review. This low price by no means infers to poor quality. It is amazingly sturdy for its price. It is made of high-quality polyethylene. This polyethylene makes it very resistant to wear and tear. It is, therefore, among the best kayak for fishing on a river. It also provides good speeds and tracking abilities. Being a sit-in-kayak, you get to enjoy exceptionally dry rides. This dryness further enhanced by a built-in collar that deflects water sprays. Sitting in this kayak is very comfortable. Foot braces ensure this. They also help improve the efficiency of each paddle stroke. A very quality back support is, also, integrated into the Sun Dolphin Aruba. The comfort it accords is not typical to sit in kayaks. It is also 30 inches wide. Coupled with a flat bottom, it is stable enough even for the greenest users. Weight: At only 40 lb, you can launch it into the water without help. Stability: It is stable enough for a first timer to maneuver. Dry Ride: You will have drier fishing escapades with this rig. Comfortable: The engineers went above and beyond to make it very comfortable. It is unlike any other sit-in-kayak on the market. Price: The Aruba is usually the cheapest kayak on most 'Best Kayak For Fishing Reviews'. This says a lot about its price-quality balance. Limited Stability: It is only stable on calm waters. One foot waves will rock you the wrong way. Storage: This is a strictly solo ride. It will not even allow the lone fisherman extra baggage. For the all fishermen who love their privacy. I advise you only to use it on flat waters. It is perfect for such settings. It is also very likely the best affordable kayak for fishing rivers. Check it out if your budget is tight. It is suited for all. From pro to novice. Pros, you will love the speed and tracking abilities. Tireless to track and propel. 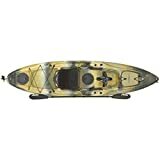 I guarantee it is one of the best beginner kayak for fishing. 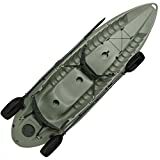 What type of kayak is best for fishing? If you are still undecided, READ ON. You should, however, remember that there is no one-size-fit-for-all. You should use this review in relation to your needs. So, what is the best kayak for fishing? Each kayak is good in its own way. Only you can decide if it is right for you. 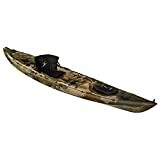 ​•Lifetime 10 Foot Sport Fisher Tandem Kayak: It is very cheap for a kayak. Stability is fantastic, and it comes with more than the necessary accessories. Standing on it is also very easy. Length: Longer kayaks are usually faster and track better on the water. Width: Width determines the storage space available and stability of the rig. Weight: Weight determines the overall portability of your kayak. Paddle or Pedals: Pedal propelled kayaks are less tiring to propel. They are, however, more expensive. Kayak Bottom Shape: It can either be V-shaped or flat bottomed. Flat kayaks are stable in calm waters. V- shaped ones are more steady on rocking waters. Symmetry: Symmetrical kayaks are slower than their counterparts. They are, however, easier to track. Asymmetrical kayaks enjoy faster speed and better directional control. Inflatable vs. non-inflatable: Inflatable kayaks are cheaper than non-inflatable. They are, however, not as durable as their non-inflatable counterparts. Footpegs: Footpegs will prove very important when changing foot position to reel in big fish.